Cloud based CRM solutions are changing the way high tech manufacturing companies work in today’s evolving business environment. Gone are the days of manually operating customer management only to leave errors in process and finally drawback in potential sales channel. Today, manufacturing companies know the resource importance of leveraging on the potential of cloud based solutions. With this brief article, we are covering some important information about how manufacturing companies leverage on cloud based CRM? What is cloud based CRM solutions for high tech manufacturing industries? CRM cloud or cloud CRM refers to any sort of cloud based CRM technology in which the software, tools and other important information of the operational process is stored on the Web and is provided to end users through the Internet. 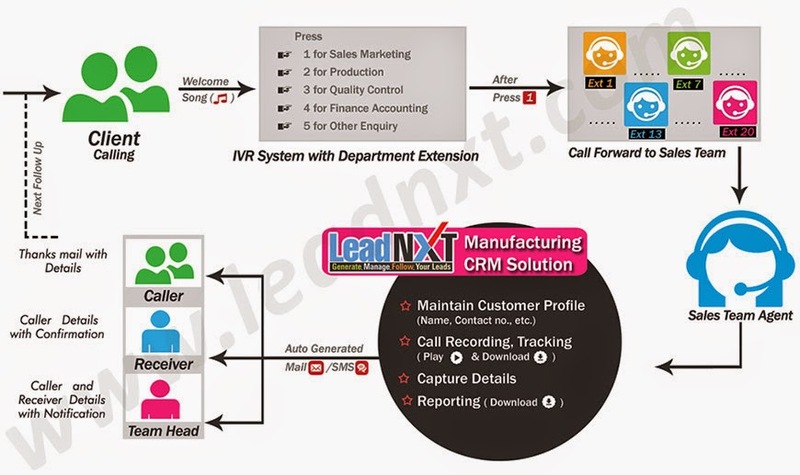 How Does LeadNXT Works for Manufacturing Companies? What Makes Cloud CRM Different & Why should go for it? There are some important reasons why cloud CRM is uniquely different. With the use of cloud CRM, you can simplify your business improvement by focusing on core errors. Cloud CRM is different in pricing model. It is an affordable alternative to costly traditional CRM solutions. It is safe and provides a safest solution to virtually store information online. It is powered by secured and improved data measurement tools and software so you can be at zero risk since the modules are being operated remotely in finest environment. So, go for it because of price, security; besides other type of benefit. What is the overall cost of this solution? Which is the best cloud telephony and CRM solutions provider in India? Excelelnt information.I will be learning that the lot of new information. Nice blog, very interesting to read. Thanks for sharing. This blog is very useful to me. Thank for a good post. Excellent post. Really very informative and Thank you for sharing such a wonderful blog. Thanks for the post. Kanhasoft offers custom CRM application development for offshore clients. We are dedicated to giving reliable and affordable Custom CRM Development Services to our clients. Visit the site to know more. Great post and informative blog.